Dunkin' Brands Group announced Wednesday it has appointed David Hoffmann as CEO. TheStreet talks with Hoffmann about the promotion. Dunkin' Donuts will have someone new cooking up the next must-have donut. There is a new King of the Donuts at Dunkin' Brands Group (DNKN - Get Report) . Dunkin' Brands said Wednesday that David Hoffmann, 50, has been appointed CEO, taking over from long-time leader Nigel Travis. Travis, 68, will assume the executive chairman role. Hoffmann, who was recruited to Dunkin' two years ago to run the U.S. business, will see his appointment take effect immediately. Prior to joining Dunkin' in 2016, Hoffmann served in various leadership roles McDonald's (MCD - Get Report) . He began his career in fast-food as a line cook at the Golden Arches. 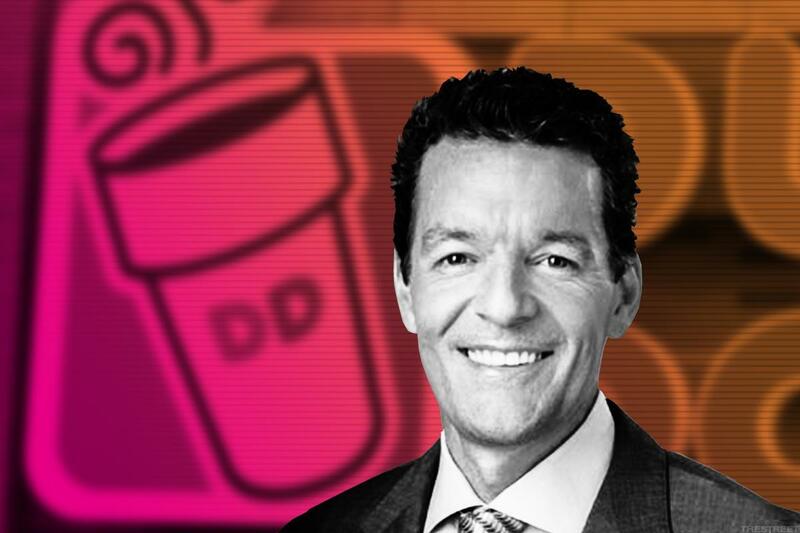 Hoffmann was the key architect of Dunkin's new three-year growth plan unveiled at an analyst day in February. "We could have done it at any point in the year, but we felt Dave had earned it," Travis explained to TheStreet on the timing of the announcement. "This is just an announcement, we have been working like this for months." Travis said he will continue to support Dunkin' in his new role, but plans to focus on other interests such as the soccer team Leyton Orient he bought a controlling interest in last summer. "We made sure this was a no drama transition," Hoffmann said. "I am sort of a product of minimum wage. I grew up in the restaurants. That has been my whole life. It was burgers and fries at 16 and it's donuts at 50." TheStreet talked with Hoffmann about his new position and plans. The interview has been edited for length and clarity. David Hoffmann, New Dunkin' Brands CEO. TheStreet: Any differences in management style compared to Nigel? David Hoffmann: When Nigel and I got together a couple of years ago we hit it off really well. What Dunkin' was looking to do was reposition the brand as great coffee fast and I thought where they were headed played to my strengths and background. I grew up in restaurants at the age of 16, I started at McDonald's as a crew person. Spending 22 years working with franchisees really played well to the 100% franchise structure at Dunkin' Donuts and Baskin Robbins. We are very laser focused on the blueprint we laid out. This was about positioning the brand for great coffee fast. It's about keeping our brand modern and relevant for years to come. TheStreet: Will you be reviewing the Dunkin' brand with an eye toward unveiling a new growth plan? What should investors expect to see? Hoffmann: No, the blueprint was my plan that we put in place. Nigel and his team did the groundwork on the brand positioning, his team gave me a peak at it. And then the blueprint was my plan that my team developed a year ago. This is what we are driving against. I have spent a lot of time over the past year with our franchisees making sure we can execute. So nothing new on the blueprint. This may sound a little boring, but it's business as usual. One thing we know we have opportunity to turn around is traffic. It's no different than others in the industry. There won't be a sea change with what we are doing. TheStreet: Did you see yourself as a CEO of a fast-food company when cooking on the line at McDonald's? Hoffmann: I am sort of a product of minimum wage. I grew up in the restaurants. That has been my whole life. It was burgers and fries at 16 and it's donuts at 50. Something about the hot breath of a daily scorecard -- everyday a customer votes on your performance -- that is something I have thrived on. I am a competitive person like Nigel. I love working with franchisees. There is just a vibe to restaurants that is a pace like none other. I spent a little time with Arthur Anderson and did the higher education with the University of Chicago but I feel comfortable in this environment. I thrive in it. I love being in our restaurants and driving the hell out of our business. Read more executive interviews on TheStreet here.